Archive for the ‘SEASONAL’ Category. The tradition of exchanging gifts at this time of the year dates back to 217 BC. 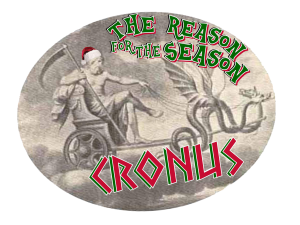 It was an integral part of a weeklong festival stretching from December 17th through December 23rd called Saturnalia, designed to honor the youngest of the Titans – Cronus. Category: EVALUATION & INSPIRATION, SEASONAL | Comments Off on REMEMBER THIS TITAN?